Like adjusting a piano, your body can be tuned to achieve optimal physical balance. 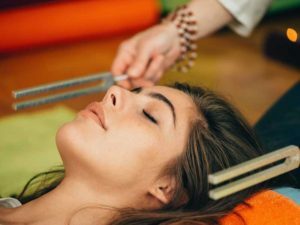 Tuning forks can instantaneously alter your body’s biochemistry and bring your nervous system, muscle tone and organs into harmonic balance. Your body enters a deep state of relaxation that will have you feeling centered and balanced. Dating back to the 1500’s tuning forks were used by the medical field to test reflexes, hearing and for broken bones. In this class we will learn about the different frequencies of the tuning forks and their uses. You will be shown how to intuitively use the forks to do healings for yourself and others.